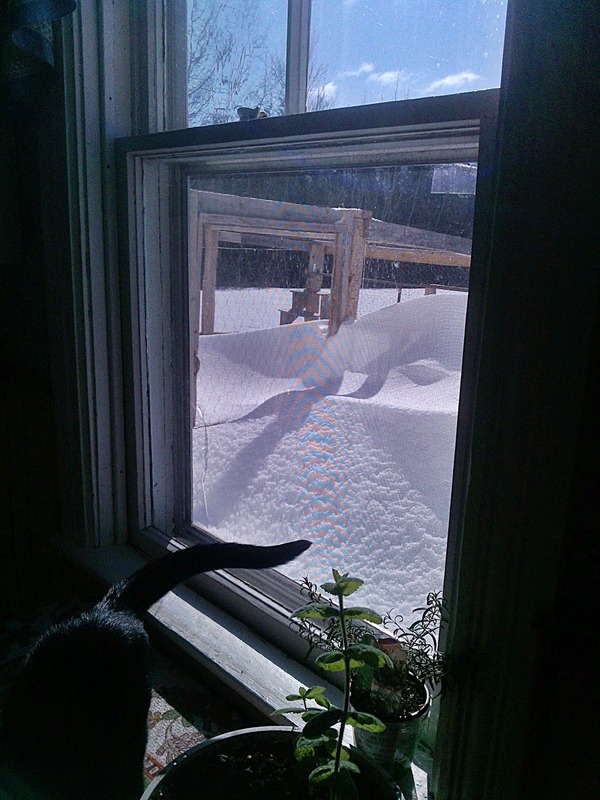 It's probably no secret to most of you that the Maritimes has been struggling under the worst winter in decades. We have already surpassed 500 cm of snowfall this winter (which by the way only started in earnest 8 weeks ago) which to those of you who aren't on metric standards, is the equivalent of 16.5 feet! As I write this entry it is once again raging like a white bull outside. The power was out for about 5 hours this morning but thanks to our handy dandy wood stove, it didn't really faze us much. It kept the house warm, allowed hot water for tea and coffee, and even made a little toast for breakfast. And a crank radio provided the entertainment. The kitties of course have been a little annoyed. Up until a while ago they were able to get out to the catio through the window. Then the snow drifted in enough so that walking out meant sinking into the snow up to the belly. 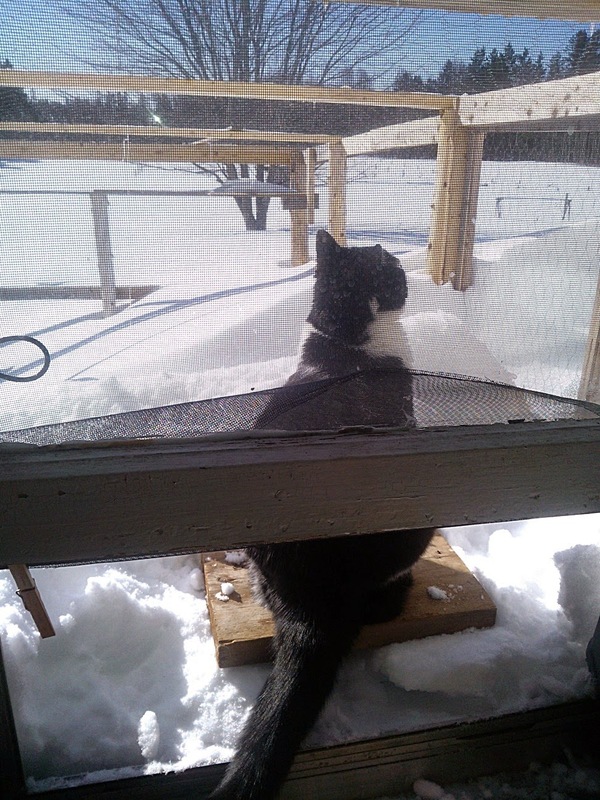 So I came to the rescue with a small block of wood to put on top of the snow for them to sit on. But recently it's drifted in so high that even though I carved out a spot for the wood, it's a little difficult to see over the mound. Keiko in particular is not too impressed. When spring finally does arrive, there will be water, water, everywhere. I guess I should get my rubber boots and life preserver ready! In the middle of this, hubby has had so many snow days (snow bound and unable to go to work) that he has started to call his days off 'vacation' days so he doesn't lose the pay. Many people on the Island are struggling because of this. Workers are trying to get buy with lost wages, businesses that struggle during winter months as it is, are struggling with lost revenues. Snow plow drivers are having a difficult time because they are getting stuck in the snow and equipment is breaking under the strain. To say that Islanders are a bit weather weary at this point is an understatement. And yet, as cranky as everyone is, it shows the character of people here as everyone gives everyone a hand; from strangers answering a call for help and converging to dig out a senior whose house is so drifted in right up to the roof, trapping them inside, to a pay-it-forward campaign where people are buying the order of the person behind them going through the fast food drive in windows. Then there was the family whose house was in flames. The plows tried to clear the way for the firetrucks but it took so many hours the house was burned to the ground before they could get there even though they were only 15 km away. The family lost everything. A friend launched a Go Fund Me campaign to raise $2000 so they could get some basic needs taken care of and in a matter of hours so many people donated that the goal was surpassed 4 times over. And so, amid the harsh conditions and treacherous situations, the kindness and generosity of humanity rises to the surface. Heartwarming! What is one to do when trapped inside? Browse the seed catalogues, of course! and dream of sunny days, warm, gentle breezes and soft earth beneath your feet. It's officially spring, but gazing outside I wonder where it is? They have forecasted more storms over the next few weeks ahead. Looks like I have lots of time to plan the building of the chicken coop and dream of fresh eggs this summer, plan the garden and dream of fresh vegetables on the table, and then there's those wonderful walks on the beach. Straight ahead in the video you can only see the very top of the swing bench and the picnic table is no longer visible at all, nor is the bench in the small pergola in the back. Hurry Spring! We need you! Seeing this amount of snow around your home I stop complaining of the cold start of spring in North Germany. Winter was very mild, we had a lot of rain and only little snow. And we missed the sunshine. But hang in there! Winter will soon have to give up! Winter is done, spring is here, and there is all that work outside to do. And I see blooming daffodils.